Although cats are very independent creatures, they certainly appreciate the warmth and care of a loving owner. Show your feline how much they mean to you with something special from AquA AnimaniA. AquA AnimaniA features a broad selection of nutritious cat food, comfortable cat beds, durable cat toys and tasty cat treats to choose from. AquA AnimaniA also has you covered when it comes to cat health: we have several cat supplements, flea and tick treatments and grooming tools available at affordable prices. 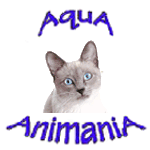 Take care of your feline companion today with the help of AquA AnimaniA!